Science & Scientists @ ESS meeting, 22nd and 23rd July 2011, Prague, Czech Republic. The registration is open on http://esss.se/s-and-s. Register today, the meeting will be limited to 170 participants. 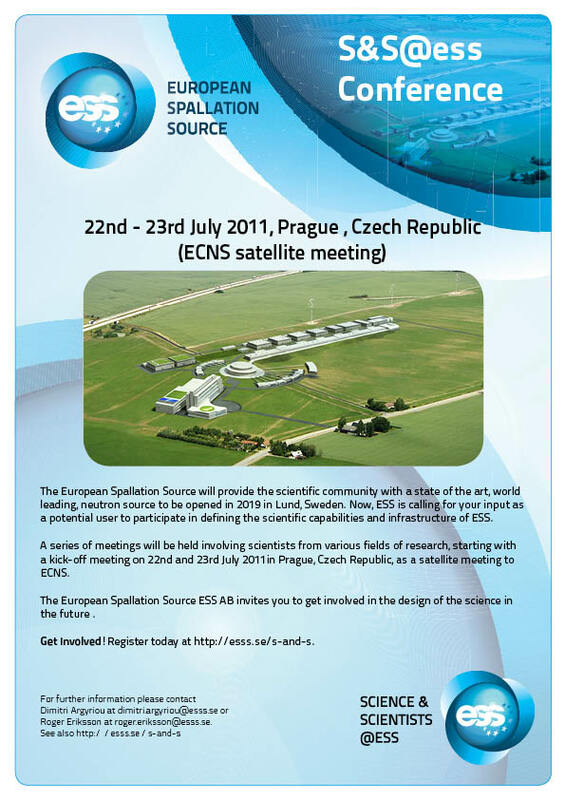 "On the 22nd and 23rd July 2011 ESS will arrange a kick-off meeting to discuss the future scientific goals of the facility as a satellite  to the ECNS meeting. The meeting will start on Friday afternoon with a plenary session and will continue on the next day. Later Friday evening the work will continue in the more relaxed atmosphere of the dinner. We will ensure that there will be sufficient time for questions and comments about the ESS Design Update and the development of the first set of instruments. You can register to participate on the conference website: http://www.esss.se/s-and-s. The meeting will be limited to 170 participants. The main Science & Scientists @ ESS meeting will be held in Berlin on the 19th and 20th April 2012. Put the date in your diary even now!"